Plus, with the free-to-download Transcend Elite App, you can easily explore files on the JetFlash 880 and quickly backup all your precious files stored on your smartphone or tablet. On one side of JetFlash 880, a full-size SuperSpeed USB 3.0 interface can be connected to any USB port-equipped devices, providing 10 times the bandwidth of USB 2.0. 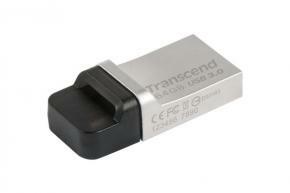 On the other side, a micro USB interface allows you to connect to mobile devices. JetFlash 880 is produced in an ergonomic design with quality metal at a much smaller size and lighter weight. Though lightweight in size, JetFlash 880 is offered in capacities up to 64GB for easy file backups or transfers. The use of innovative COB (Chip on Board) engineering ensures that the JetFlash 880 is completely resistant to dust and water, bringing you to another level of durability. Wilu u dit product bestellen? Vul dan onderstaand formulier in en wij nemen zo spoedig mogelijk contact met u op.